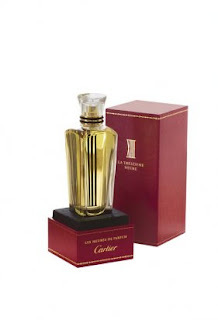 Unbelievable Beauty: Breakfast at Cartier to Launch Les Heures de Parfum Collection | Fashion. Style. Beauty. | Life is short. Live well. After I picked myself up off the floor (because, let’s face it, things like this don’t happen every day), I happily said yes and arrived for my first opportunity to have breakfast in the private conference room of the Cartier Mansion on New York’s famed Fifth Avenue to have a Skype conference with Mathilde Laurent, the company’s master perfumer, in order to discuss the launch of Cartier’s new fragrance collection, Heures de Parfum. I – L’HEURE PROMISE – the Hour of Promise, inspired by new beginnings, possibilities and the thoughts of angels and their protective halos of light. The notes are those of iris, sandalwood, herbs and musk. Laurent crafted the fragrance so that one would feel protected wearing it. I got chills smelling the scent. VI – L’HEURE BRILLANTE – the Hour of Brilliance, which actually caused me to see stars when I inhaled the fragance (and in a good way). Meant to channel the energy of light, neon, stars. She created it so that the wearer felt as if they were surrounded with something effervescent and delightful, like dipping into a glass of champagne. Notes of this fragrance were citrusy, with lemon and gin notes. V- L’HEURE FOLLE – the Hour of Folly, described as a time when nature cannot be tamed. Designed for the free spirit, of life not yet fully realized, the scent of unripened fruit about to burst is the best description. The scent is an homage to the House of Cartier’s relationship with the US and the roaring 20’s, when wealthy American women wore Cartier’s Tutti Frutti bracelets, a piece cut with gems that looked like fruits. Laurent described the fragrance evoking an urge to “bite into life.” Peppercorns and unripened berries are the jazzy notes in this perfume. XII – L’HEURE MYSTÉRIEUSE – the Hour of Mystery, is described as “a private perfume.” Laurent’s description during the breakfast was that it’s “about the mystery inside of you, a private hour of life, an invitiation to secrecy.” A very intimate scent, it’s meant to be enjoyed as close to the skin as possible. Voluptuous incense, jasmine and sandalwood capture the mood. I cannot fathom the unbelievable excitement that you would have felt by receiving this invitation. That is truely an honor. 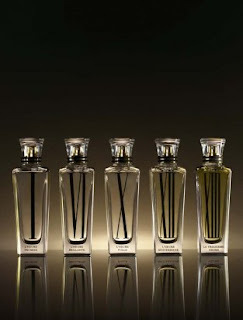 Fantastic descriptions on the parfum collection as well. I love the concept behind it, truly an amazing collection.